Here’s your chance to own your own Food Truck Business! Start tonight! We are offering our 1990 Ford Grumman Box Van fully set up and currently working successfully in Dover, NH. We have an opportunity to relocate out of State and we want to continue to offer our customers the same great food they expect. We are currently doing late night service in a lucrative location and doing quite well. The truck is fully inspected and permitted. 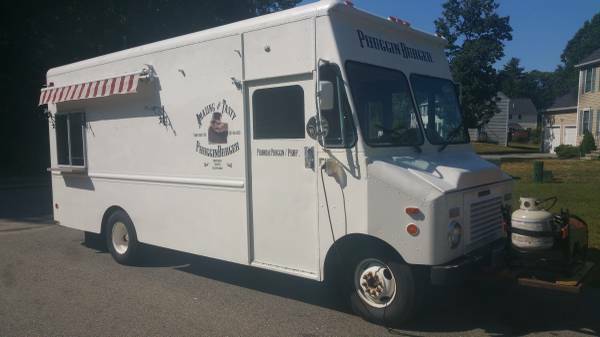 Currently set up as a Burger truck, it includes: -36 inch Flat top with exhaust hood -Countertop commercial Friolator -Refrigerator -Deli prep Fridge -2 year old Ansel System -3 crock crock pot -5500 Propane Generator -Business name and menu The engine does have some issues, but has been fine for short trips down to our location. We have a large loyal customer base with little to no competition at this time. You could start making money immediately!